Highlight – A personal assistant for your home, and a killer sound system to boot. Artificial intelligence has been seen as the future of computing for some time now, and while it's been difficult enough to actually create it, it's been almost as tough figuring out how to market it. Enter Google Home, a non-obtrusive, and rather charming 360-degree speaker that's designed to sit throughout your home and help you with many tasks throughout the day, from playing music to reminding you of important things you forgot to do. Google Assistant may power Google Home, but is it worth it to shell out more cash for something your smartphone might already do? Let's take a look. As Google Home is primarily a speaker, specs are important for any audio aficionado to be able to rate such a product on paper. 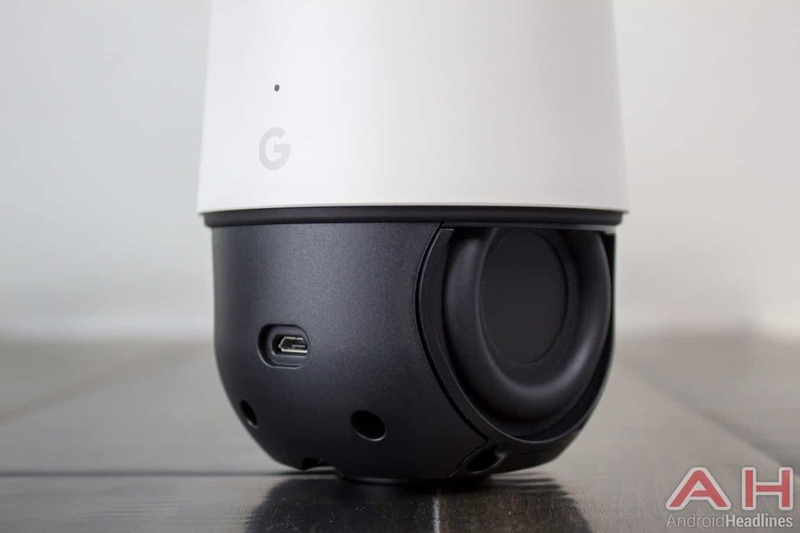 Starting with the design of the body you'll find Google Home is a rather small speaker that's meant for a table, counter or shelf, topping out at 5.62in/142.8mm high and 3.79in/96.4mm in diameter, or just a bit larger than your average coffee mug. It weighs a mere 1.05lb/477g, with most of the weight distributed toward the bottom for the best balance. A 1.8m 16.5V/2A power cable is included with Home, and plugs into the bottom via a flat cable to keep the unit from easily becoming unplugged. Underneath the removable base you'll find an array of speakers, starting with a high excursion speaker with 2-inch driver, which is flanked by dual 2-inch passive radiators on either side of the unit. On top you'll find dual far-field microphones for powerful voice recognition, and dual-band 2.4GHz and 5GHz WiFi up to 802.11ac speeds power the wireless side of the equation. Supported audio codecs include HE-AAC, LC-AAC+, MP3, Vorbis, WAV (LPCM) and FLAC, as well as high-resolution audio streams. Google Home is compatible with both Android and iOS, much like the rest of the Google Cast enabled devics are, and as of this writing only ships in white with a slate fabric base for $129. Google's product designs have evolved considerably over the years, especially since Matias Duarte joined the team some years ago. As a product primarily designed to be placed around your living quarters, Google Home has an incredibly attractive, but not overly stylized design that goes with just about any type of décor. Resembling something between a piece of pottery and a sconce, Google Home is a rather simple looking speaker that could easily be mistaken for a candle or some other home accessory on your counter, table or entertainment unit. It's also innocuous enough to be placed on a night stand in a bedroom or alongside a desk in an office. Part of what makes Google Home such an easy set piece in the house are the interchangeable bases that Google has made for the product. These bases come off with a simple twist anywhere on the different colored base at the bottom, and are held in magnetically for easy changing. You'll need to unplug Google Home in order for this to work, but it's not likely you'll be changing out bases all the time, so this shouldn't be much of a problem for a product that's designed to be stationary. Bases start at $20 and come in 6 different colors: Carbon, Copper and Snow are all metal bases with a richer look to them, while Mango, Marine and Violet are all fabric bases with a more comfortable look and feel to them. Having these different colored and textured bases helps make Google Home a little more interesting than if it were just made of the white polycarbonate that the top 2/3rds of the device contains. There is a definite front and back of the device, and Google Home is primarily designed to be placed back against a wall with its downward slope facing outwards. Part of this is simply the design of the look of the product, however there is also a functional design here. This slope contains two far-field microphones that are designed to hear you throughout most of your home, of course depending on the size and design of your home that is. Between these two microphones you'll also find a soft-LED array that lights up and flashes with colors on boot up and during commands. This array doubles as a touch pad to mute whatever is going on, including music playback, ending alarms or just stopping anything else that's going on with Google Home. You'll also find a physical microphone mute button on the back to mute the "OK Google" trigger for Google Home, giving some piece of mind that you won't accidentally set Google Home off in the middle of the night or during a party if that sort of thing causes concern. The base of the unit is rubber, and the entire base itself is intelligently weighted most at the bottom, meaning any slight tip will often just wobble Google Home back to its upright standing position. Aside from this you'll find the power outlet at the bottom, which fits a flat power cable included in the box and not only keeps the cord from accidentally falling out or becoming unplugged, but also sits flat to keep the unit from wobbling on the cord. There is no battery inside Google Home, so you won’t be able to tote it around your house, rather it’s solely designed to sit somewhere semi-permanently. Removing the base reveals the large single speaker and dual sub woofers inside. As Google Home is primarily a speaker, it’s pretty important to know how good the speaker actually sounds and whether or not this functionality is worth the price of entry. With a 2-inch speaker and dual 2-inch radiators, you’d better believe the Google Home speaker sounds absolutely fantastic. Audio playback features a wide range of sounds, including some incredible bass and an overall very balanced sound output in general. Google Assistant has a realistic sound to the default female voice, without the hiss or pauses of many mechanical voices from cheap speakers. Music sounds absolutely phenomenal on the speaker too, and everything from deep bass to clear voices are the norm here. I found every type of music tried sounded simply great, and no fussing with equalizers or any other audio properties were needed. This is a great audio experience out of the box and will surely replace the existing Chromecast setup I’ve got in my living room. Volume of the speaker is more than loud enough to hear throughout the house at 50% volume, much less any higher. I never found a need to turn the volume above 60% for any reason at all, and all of this volume can be controlled either your phone via the standard media volume, through the Google Home app, or by your voice. One thing to note is that the main speaker faces straight outward from the front of the Google Home speaker, meaning no 360-degree audio from the middle of the table or anything. Design wise this isn’t an issue since the Google Home is required to be plugged in and doesn’t run off of batteries of any kind. I found that even though the sound technically comes straight out of the front of the unit, the actual audio resonated throughout the house beautifully, and given that two separate radiators are located on each side to help with lower frequency audio, you’ll find clean and clear audio will fill your home, particularly the room that Google Home is in. The app called Google Home wasn’t always called that, in fact it started life out as the Chromecast app, became Google Cast last year as Google expanded its casting service to other devices, and now is Google Home. While this is certainly confusing for users expecting a certain name and icon when looking in their app drawer, Google Home certainly makes sense for an app that handles casting to all supported devices within your home, although the confusion with the name of the physical product we’re reviewing today is definitely not making it easy. Either way the actual app in question hasn’t received a facelift, rather just some significant feature enhancements outside of the new name and icon. Setup of the Google Home speaker works exactly as setting up a Chromecast or any other Google Cast compatible device, and is as easy as pressing the giant plus button in the devices section. The Google Home app will then walk you through adding your Google Home speaker to your home’s network, as well as giving it a named location throughout your house for easy identification. As a product Google Home is meant to work in conjunction with additional Google Home speakers as well as other Google Cast products found throughout your house, so naming it and giving it a physical location within the confines of your walls helps you not only identify it when sending something, but it also helps Google Assistant know where to send casts as well. Once you’ve added your Google Home speaker to the app you’ll find it in a list alongside all your other Google Cast compatible devices, and this is where the magic really begins. Since Google has designed Google Cast devices to work together, Google Assistant is able to interface with all the devices paired with your account. Google Assistant is able to not only send other casts to the Google Cast devices on your account like videos and music, but it’s also able to sync audio between supported devices for true multi-room audio. This is like the old in-home sound system concept, but considerably easier to hook up and use. At the time of review only Google Home and Chromecast Audio supports this multi-room feature, but it’s as easy to start as saying play this song on my bedroom speaker, or wherever you might place the supported device. When playing media on your Google Home speaker, you’ll find a notification appears on any phone or tablet you might have associated with your account. This notification is sent via Google Play Services and is designed to give you manual control over media played on the Google Home in addition to the normal verbal commands. I found this to be particularly convenient as my wife and I have each other’s accounts on our devices, and both of us would have the controls to Google Home without needing to invoke an app or do anything on our devices. As long as something is playing on Google Home we could pick up any phone in the house and control the media without extra steps, something that’s a clear advantage over regular Google Cast devices. As this is Google Cast it’ll work with any app that casts audio, including YouTube Music, unlocking a massive library of tunes that might not otherwise exist on other subscription services. Google Home also works with a number of third-party supported smart home devices such as Nest, Philips Hue, Samsung Smart Things and even IFTTT integration. Being able to adjust your lights or thermostat via voice is simply amazing, and doing it all hands-free is even better. The last part in particular is quite a doozy though, as anyone familiar with IFTTT and their “recipes” will know how powerful of a tool this service can be. IFTTT allows you to either create your own actions, such as turning on the lights and setting your thermostat to a comfortable level when leaving work, to even something as crazy as turning your house into a party home via color-changing Philips Hue bulbs throughout your house. It’s this integration with third party devices that gives Google Home the most potential of all, as it gives you hands-free access to smart device control from anywhere. We’ve already seen Google Assistant in action throughout a handful of products, and while it was announced back in May at Google I/O 2016, Google’s Pixel phones were the first to feature the fully functioning Assistant. Folks who have tried Google’s new chat client, Allo, might be familiar with the lite version of Assistant, but the full version has considerably more features to say the least. Starting with the voice you’ll find the absolute best and most realistic sounding human voice ever from any consumer product on the market. Yes this is the same voice you’ll find from Assistant on the Google Pixel, but coming from a speaker that’s so much larger and higher quality really reveals the work that went into making Assistant’s voice sound real, rather than the overly computerized mess that Siri is. Natural language support has been something Google has been working on for years, and it really shows in both the way you interact with Assistant and the way it interacts with you. Voice playback is important, but recognizing what you are saying when you speak with Google Assistant is likely the single most important measure of how successful an AI-based assistant can be. Thankfully Google has utilized some pretty incredible microphones on Google Home. Called far field microphones, the dual microphone array situated at the top of Google Home is located on a slope that measure about 35-degrees and faces toward the front of the device. The combination of dual microphones facing opposite directions, as well as this more natural slope create an ideal design where the special microphones can use spatial calculation to derive actual voices from the normal noise going on in the house. In fact I found that no matter how much noise was happening inside my house, Google Assistant recognized the telltale “OK Google” command without a hitch. There were even times that my 2 year old son was able to trigger the OK Google command and ask it what song was playing, even though he speaks through a very thick toddler accent. In testing just how far I could get from the unit while still recognizing my voice, I ventured into the back bedroom and loudly spoke “OK Google,” without yelling or obviously throwing my voice. Results were almost perfect, although depending on the complexity of the command it may not have understood all the words from such a distance with walls and halls echoing the sound waves. I’ll hold off on giving Assistant a gender for now, even though the only voice is female, as it’s likely Google will add more voices to personalize the experience further in the future. Since Assistant isn’t brand new with this device we won’t go into detail on every single thing that can be done with it, but it’s important to note some of the functions that make Assistant particularly useful in the context of your home. In playing around with the setup I found Google Home was best suited to my kitchen/dining room area, not just because it’s nice to have music there, but because the commands Assistant takes seem to be best tailored for that environment with Home’s design. While cooking I was able to tell Home to set a 20 minute timer for pizza, a 5 minute timer for the toaster oven, and even a separate timer for how long my son was allowed to watch the movie he was in the middle of. At the end of each time Assistant will give off a pleasant tone and let you know “time is up for the pizza,” or whatever else you told it. It’s this sort of natural interaction with Google Home and Assistant that makes it such an important product when using it in the context of your home, and the recognition and actual translation of your words into meaningful and useful terms that’s so incredible. Other some such commands I got familiar with were asking for various measurements when cooking, such as converting 7 teaspoons to milliliters or other difficult tasks like that. Playing music was simply a joy too, as voice commands for these tasks are as natural as they come. Saying “OK Google, play spooky symphonies on Pandora” results in a public playlist on Pandora, dubbed “Spooky Symphonies,” immediately playing on Google Home with some quick feedback from Google Assistant letting you know what it found. Music control can be done however you want, either via the previously mentioned notification on your Android-powered device, by tapping the top of Google Home to mute all audio, or by essentially any audio command you want. Need to return to the beginning of the album playing? Just say “Play this album from the beginning,” and Google will rewind play for you. Want to turn the volume up? Either simply say “turn volume up” or give it an actual percentage to move up, such as “increase volume 15%” or even the more specific “increase volume to 60%.” It’s natural, incredible and just works. Not every command works just yet though, and it’s likely you’ll fool Assistant from time to time, or issue a command it’s not yet allowed to do, or doesn’t know how to do yet. I didn’t run across too many of these in my time with the unit, but from time to time I wouldn’t be able to perform some actions I thought would be accessible to Assistant. As with Assistant on the Google Pixel, you’ll be able to ask it what the traffic looks like on the way to work, what the weather looks like, and even ask about your upcoming schedule for the day, which will return not only calendar entries and important events happening that day, but also news snippets for your morning, keeping you up to date with world and local events all while getting ready in the morning. Assistant is incredible no matter how you slice it, and thanks to the way Google has designed Assistant, it’s going to constantly grow and become smarter the more you use it. Much like other Google products, Google gives users complete control over what information is shared with the cloud, as well as complete control over historical data that Google Home collects and interfaces with. The Google Home app contains a Google Assistant section under settings which details a number of privacy and decency settings to cover both personal information as well as restricting inappropriate content on YouTube music. From this section you’ll also be able to specify your home address, the address where the Google Home device is located as well as other such personal information. Those concerned with privacy in particular will find the entirety of their historical data found under the “My Activity” section here in the Google Home app. What’s impressive here is that every single command you’ve ever issued to Google Home will be found in this section, all sorted into neat little cards containing the time, date, place and command, as well as a voice sample returning exactly what was said during the exchange. These are all searchable too via the handy Google search bar up top, so if you’re wanting to delete a specific request or just can’t remember what song Google Assistant told you was playing last, all of your information can be easily accessed and deleted at will. Do you need Google Home in your home? If you’re looking for the easiest way to cast music there could possibly be, a hands-free way to interact with all your favorite things on the web, or just to have an easy way to set timers and find measurements when cooking, Google Home is the very best way to experience Google Assistant in the context of your home. With a fantastic speaker and some great looks, Google Home is meant to undercut the competition not just in price, but in the way it fits into your life with the content and services you’re already familiar with. Grab this one today, it’s a must have for sure!